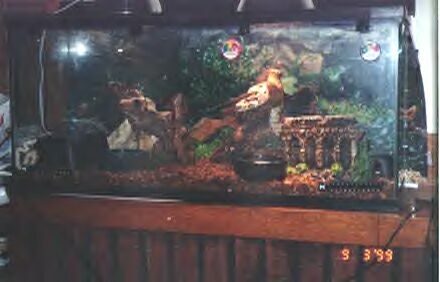 This is a 30 gallon aquarium that holds my 2 baby boa constrictor's, Athena and Napoleon. 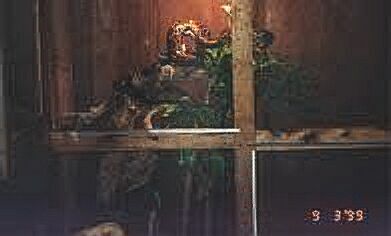 The substrate is Repti-Bark. It has a hide boxe on either end, and a water dish on either end as well. It also has a tree in the middle to help give a hot spot. It's got some plastic plants that are basically just decoration. There's an under tank heater on the left end. The top has a 36" Vita-Lite flourescent light, a black night light, and a heat light. The black light is 60 watts and the heat light is 250 watts. Temps range from about 80 - 95 and 105 at the hotspot. Humidity stays around 70%. This the cage that I use to hold my Burm's. It's not a great picture, but maybe with a little telling, one can picture it better. It's 6 feet tall, 6 feet wide, and 3 feet deep. It's got a 4 foot flourescent on the top, and a floodlight that I use to heat up a basking spot. Temps rarnge from 83 - 95 at the hotspot. Humidity isn't as high as my baby boa cage, but that's ok. In the bottom they have pine shavings and some pieces of slate. There are two water dishes that are actually cat litter pans. They're each 2 foot by 3 foot. I have a couple of trees that I got a Target for $6.99 each. There's also a tree that they climb on that is made out of grapevines. There's five pieces of grapevines to make the tree. Grapevines sell for around $30 here, and I got the cage for free....you do the math. The cage is built out of 2x4's and plywood. The front is 4 pieces of 1/4" tempered plate glass built into doors. You can't see that here, because I took the picture with the doors open.